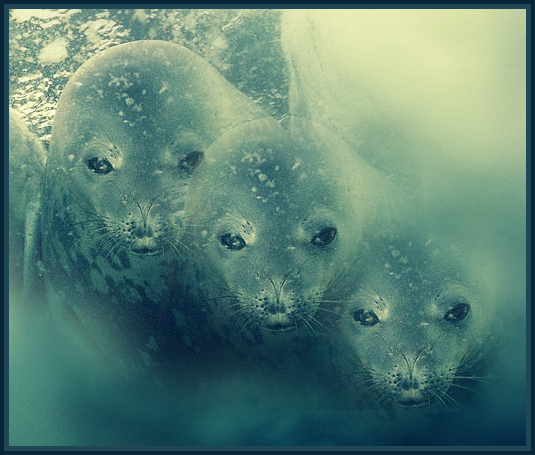 Selkies are faeries of the sea and there are many different versions of their stories. They take the shape of a seal when they are in the water and when they come to land, they may shed their seal skins and take human form. If you come upon a Selkie in its human form, find its skin and hide it away, the Selkie is yours. The moment it discovers its seal skin, however, the call of the sea is like nothing else on earth and the Selkie will flee back to the ocean without a moment’s hesitation. In the version that I am most fond of telling, a kind and gentle farmer comes upon a circle of Selkies dancing, in human form, on the shore under the light of the midsummer’s full moon. He picks up one of the skins and hides it behind a rock. When the faeries realize they are discovered, they run for their skins and dive with soft splashes into the water – except for one. She is more beautiful than anyone, or anything, he has ever seen and he sweeps her up over his shoulder and carries her to his home. The Selkie is bound to him for howsoever long he is in possession of her seal skin – about which they never speak a word for the 7 years they are together. As a mirror of the psyche, the Selkie, or Woman of the Sea, may represent our wild nature which dances under the midsummer’s full moon with great joy. She holds the knowledge of the treasures and mysteries of the sea – our deep psyche and well of emotion. Our mundane self must bury the seal skin, or true identity, of our Selkie in order to keep her by its side. From this union creativity emerges, happiness and a sense of purpose as well. The Selkie conjoins with the mundane self and grows a sort of love for it. This love, however, cannot replace the resonance and communion embodied by the seal in the embrace of the sea. How do we, in our daily lives, connect to this unbounded, deep wildness in our natures? It is a peaceful wildness, full of joy and completeness. We each have the opportunity to live alongside of it, for a time, and to bring creative expression to life in our ordinary reality. As this version of the story tells us, it never completely leaves us, even after retrieving its skin and returning to the deep.